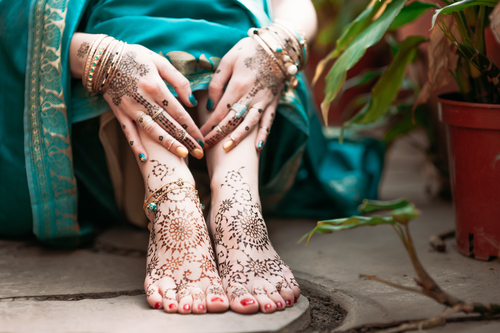 #BeautyDiaries: I Managed To Get My Wedding Mehendi On My FACE! You all must have heard of wedding mishaps where the baraat turned up 2 hours late, the DJ fell ill and had to send a backup, or where the chair drapes where pink and not bright pink! Even I had heard of such incidents and was prepared for one odd thing to go wrong at my wedding. It’s natural, everything cannot be perfect. But well, sometimes things do go wrong and in the worst possible way. The ceremonies had begun full swing, my friends and relatives were pouring in and dhol beats filled up our house. This was also the first time that I actually started feeling the nerves. Our first function was the cocktail after which was my mehendi ki raat and wedding the next day. The mehendiwallahs arrived a little later than expected, but it was fine - we had the whole night to ourselves! It was a small ceremony at my home with just the closest ladies in attendance. The mehendi began and that’s when I realised just how long and tiresome the whole process is! 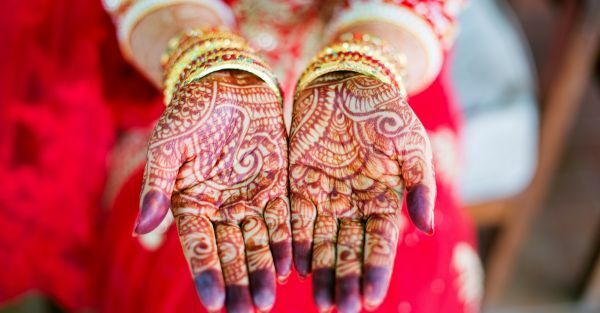 It took 3 hours to complete my bridal mehendi! And by now I was exhausted! Add to that the fact that we all had to wake up early for a pooja and the chura custom. My ever-so-loving mom suggested I lie down for sometime...because obviously sleeping wasn’t possible till the mehendi had dried properly. I carefully placed my body in a way that my hands and feet were in the air and not touching anything (basically half-on and half-off the bed!). But I have no idea when, even in that uncomfortable position, I drifted off to sleep. Somewhere in the middle of the night, I sensed someone come into my room, switch off the light and shut the door behind them. I had a nice long good night sleep before my sister shook me awake. And the expression on her face told me something was wrong. I had a mehendi imprint on my face! I had dozed off with my face on my semi-dried hennaed hand and now had a clear design on my cheek! On my wedding day! On my clear flawless skin that I had worked so hard to achieve! I was going to make the weirdest bride ever with designs on my cheek. And all the chachis and buas just made it worse. They said it was because my mom had not done some pooja that ensures a fuss-free wedding! One of my relatives made a thick besan pack to rub on my face. I tried face scrubs and neem packs and what not, but nothing worked. The stubborn imprint did not even lighten. By now it was time for the chura and I had no option but to sit through it looking like a complete idiot! I couldn’t even concentrate on the ceremony. All I was thinking about was how the hell will I ever get rid of that mark. The day progressed and by around late noon by makeup artist arrived. And boy, he was shocked to look at me. “What have you done to yourself? !” he shouted in his typical OTT manner. He was aghast! It actually took him a couple of minutes to calm down. He hurriedly unpacked the giant makeup kit and started looking through various products. He took out some 4-5 shades of foundation and tried a swatch each on my face. He then gave me a confident look and asked me to sit down so he could begin work. I have had professional makeup done a couple of times before and I knew that thanks to my clear skin, foundation usually doesn’t take very long. But today, it felt like a never ending process. Rubal* took almost 45 minutes before finally letting me see the mirror. And when I looked at myself, it was like there never was anything on my face! Thank god, the imprint was gone! It was hidden under layers of expertly applied foundation and concealer. Before I knew it, I was smiling. My first real smile of the day. The wedding went on till the wee hours of the morning and me and my husband crashed as soon as we entered our new home. The next morning I woke up to see my husband staring at me, looking rather confused. My makeup had obviously come off and that annoying mark was back. I explained the whole thing to him and he just couldn’t control the laughter. That’s not it, most of my in-laws had a good laugh and till date this incident is recalled at every family gathering! Images: Shutterstock HAVE A STORY IDEA FOR POPxo? If you want to hear about it, we can write about it! Just tell us your idea here! MUST-READ: #BeautyDiaries: How I Prepared My Skin For My Wedding Day! MUST-READ: #BeautyDiaries: 6 People Asked What I Did To My Hair This Week!